The 2015 Topps Football Complete Set is a quick and easy way to build the company's flagship football set. Cutting the chase that comes with busting packs, it comes with the full base set. The hobby version also comes with five parallels not available anywhere else. 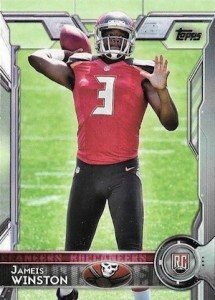 The 2015 Topps Football set has 500 cards. This is up from the 440 that has been the standard for several years. This also marks the 60th anniversary of the card maker's foray into football. The checklist consists of regular player cards for veterans and rookies as well as subsets for the Super Bowl, award winners and more. In addition to the main set, the 2015 Topps Football Complete set has five Orange parallels that can't be found in packs or other versions of the factory set. All 500 base cards have Orange parallels so tracking down singles of specific cards won't be easy. The retail factory set offers five exclusive cards as well, but they are image variations for five rookie players. Lastly, the online-exclusive factory set through Topps' site does not have any additional cards, but all 500 cards in the set have a special 60th Anniversary logo stamp in foil. There is also a special Super Bowl edition that is exclusive to the Topps online store and features a Super Bowl 50 logo stamp for all 500 cards. plzzz.tell me where is the checklist ?,I want 2 down load it so I can c who is in the set plzzzz.help here & thanks. Doesn’t this just make buying the hobby version useless? Why would I buy Topps hobby if a month later I can just buy the whole set. As a set builder I would hate this because it makes it pointless to try and build it. So realistically the hobby version should just have one pack that contains the autos and parallels and leave the base for this offering.